Tsk, tsk, bad company formerly known as Time Warner Cable (now Spectrum). Email sent without encryption. Testing sending to cox.net. The red lock icon means it’ll be sent insecurely. Is that good? Does that mean we’re >80% safe now? What does that even mean? Email transport encryption is still voluntary and optional. As the Google Transparency report showed, ~20% of email today is still being transported totally unencrypted. That means that any simple attacker with read access to the network between the email server of the sender and that of the email recipient has the capability to read the entirety of the message. Because transport encryption is optional, even the other ~80% of encrypted email traffic may be subject to a man-in-the-middle downgrade attack, so under many circumstances a sophisticated attacker with interception access to the network between the sender & recipient servers has the capacity to strip the encryption and read the message. A proposal published in 2015 (RFC 7672) called DNS-Based Authentication of Named Entities Transport Layer Security (DANE TLS) would use Secure DNS (DNSSEC) to specify and require email server encryption, but adoption of that proposal is dependent on the adoption of DNSSEC which itself is controversial and has been very slow to this point. A different proposal, SMTP MTA Strict Transport Security (SMTP MTA-STS) would use regular DNS and a secure web service to specify and require email server encryption, but is still currently in draft status and if/when it is published will still take time for significant adoption. In conclusion, while >80% encryption of email transport is a great start there are still gaping holes in the picture that should prevent anyone today from calling email transport secure. A persistent and sophisticated enough attacker still has plenty of opportunities to break into your email as it’s being transported, even without hacking into your account specifically. This was an interesting refresher for me, having looked into email security in the distant past4 but not having read much about the recent progress made. I’ll have to remember to check back in on it later, maybe we’ll be closer in 2018! Fingers crossed. I reinstalled Windows on my desktop and laptop from scratch earlier this week to fix some nagging issues and clear out the cruft. Starting from a blank slate with a fresh install (vs an upgrade or install in-place) always makes me feel great. That’s a little sick, I know. But all the apps work like they’re supposed to and the computer just feels more… solid. As more of my life goes into the cloud, the list of software I need to reinstall gets shorter, and with Chocolatey and a USB drive with a few installers, I can do full OS reinstall in under an hour. With Chrome Sync, after reinstalling the browser and logging in, all my extensions, settings, saved passwords and bookmarks magically re-appear. Everything is awesome! I could go on for a while, since every site that I can turn on 2-factor authentication for I have done so. This greatly increases my security in case my password is ever hacked or I get phished. It also means that after reinstalling I got to spend tons of time and annoyance getting SMS text messages, Google Authenticator codes, security code emails, and typing in answers to security questions. Normally the 2-factor authentication only requires verification periodically, and you mark your browser as a “registered device” to avoid having to jump through the hoops. To do this, your browser stores a “cookie” with an authentication token used on future visits to the sites you register. And although Chrome Sync restored 29 apps, 16 extensions, 202 settings, 415 passwords and 52 bookmarks for me, it does not sync cookies!! This is of course by design. Normally syncing cookies would be a really bad idea since it would defeat the purpose of 2-factor authentication. But when reinstalling your computer, it would be nice if there was a way to bring over cookies. You used to be able to do this by copying the Chrome User Data folder, but this was a bit of a security risk because that meant your passwords and cookies were sitting around on your disk unprotected and could potentially be stolen. So in 2014 Chrome started encrypting protected data like cookies, using a special encryption key that is different for every user and computer. I’d reinstalled Windows a few times since 2014, so I’ve gone through 2-Factor-Apocalypse a few times, with each time getting worse as more sites allow 2-Factor Authentication or implement security questions or email processes. To make things worse, I’ve started installing Windows Insider pre-release builds, so I’ll probably reinstall from scratch again soon and have to go through the whole thing again. Madness! It slices, it dices, it backs up and restores cookies for multiple profiles at once. You can check out the tool on GitHub, and use it to avoid 2-F-Apocalypse the next time you update your machine! 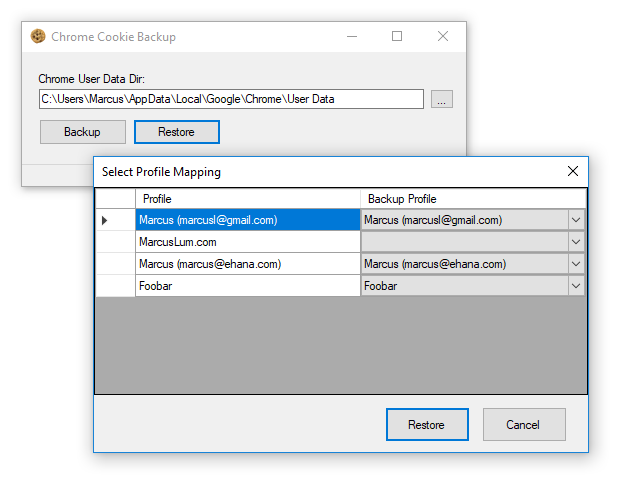 Just make sure you run the backup before you wipe out your old install since you need to log on with the Windows user account of the Chrome profile to create the decrypted backup file. And sorry, it doesn’t work on Linux1 or macOS since the encryption used there is different. And they have an awesome logo! Although Serverless is built on AWS Lambda, and AWS has an email service (Simple Email Service), I decided to use Mailgun since it gives you a free sandbox domain so you don’t have to set up a custom domain for your email, and also gives you 10,000 free emails per month. The code is configured to let you set up an email address like slack+[channel]@example.com, which will let you post notifications into a specific channel. I set up shipping delivery and last-minute travel deal notifications to #alerts, and all the Hamilton lottery rejection emails to go to #wah-wah. If you’re an avid reader of blogs and still got your head in the sand using RSS you probably use a feed aggregator service like Feedly to read your news. Putting aside the argument of whether RSS is dead and everyone uses Twitter or Reddit to get their news, feed readers can be useful at least to provide an app like Reeder or GReader content for you to sync offline and read while you suffer through internet withdrawal on a plane (although this has changed much in recent years with most flights, even over the Pacific or Atlantic getting internet service). Well, have no fear dear reeders, and enjoy whiling the time away in-flight (assuming you remembered to sync your feeds before you went into airplane mode), because Feedability is here! 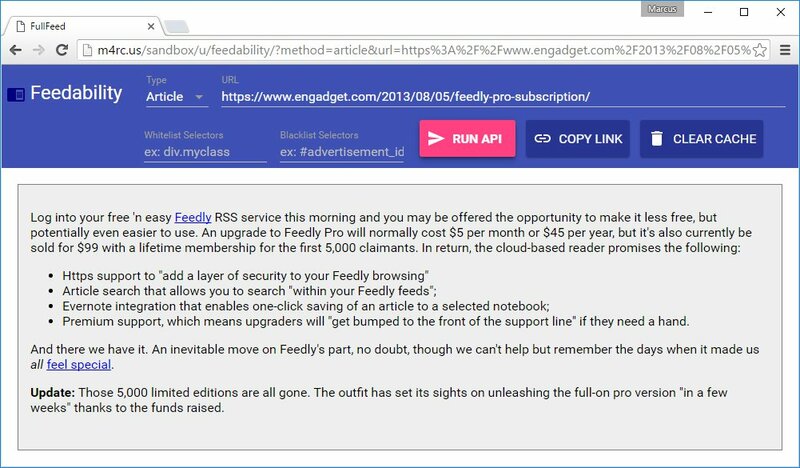 Feedability is a full feed readability server, which takes existing RSS or Atom feeds as input, and replaces the truncated article synopsis with the full Readability‘d version of the feed entry links. As shown in the screenshot above, you can preview article content to tweak it with CSS white/blacklist selectors before generating a feed link–the Readability library (the same one used in Firefox for its “Readability mode”) does a pretty good job at extracting the page content but sometimes needs a few hints to find all the article content and exclude non-content. Feel free to fiddle with the demo site, but if you want to use it for real you’ll have to set up your own server since the demo site has IP throttling to avoid tons of people from using it and overloading my demo server. This is another tool that’s aimed at the techie crowd, but let’s face it–normals don’t really use RSS anyway. Besides, there’s some joy in tweaking the CSS selector rules to get your feed looking just right (until the authors change the page layout, but whatever). So, hope this is useful to you and if not at least now all of my feeds are full-feed, and as a bonus I got to learn about the Materialize CSS library (to the point: don’t use it, too immature) and then Polymer (two-word review: thumbs up! ), and the recently released ASP.Net Core 1.0.